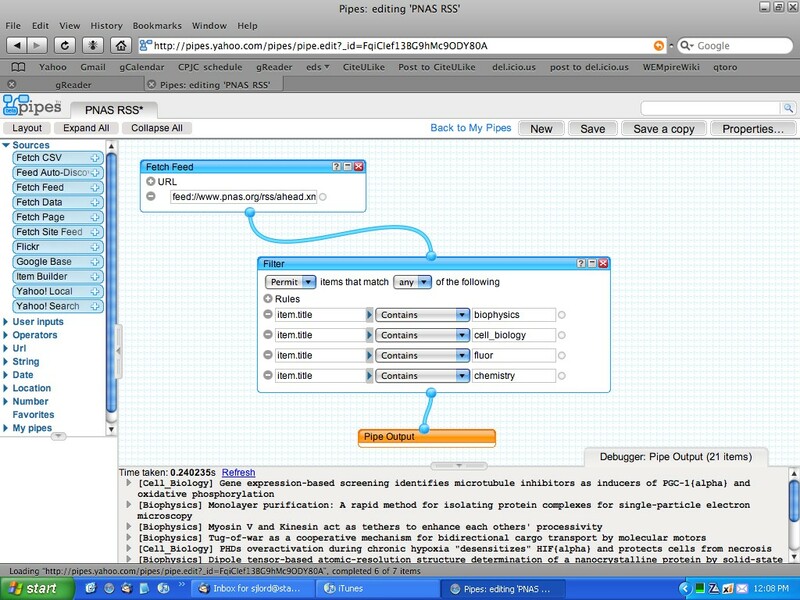 Scientists have many options for organizing, reading, and syncing PDFs of articles: Papers, Mendeley, iPapers, Endnote, BibDesk, Zotero, and more. And now Papers2 was just released! Honestly, Papers2 is a little disappointing, so far. But I suppose I was expecting a lot. But I still have high hopes for it. The support staff is working very hard to fix bugs and add functionality that users are screaming about on the discussion boards. The automatic metadata grabbing might be nice, if it ever works. Mendeley tries to do that, too, but I’ve never been impressed. I really liked that Papers1 made manual matching easy (by highlighting the DOI, for instance). The new interface and searching mechanism seems much clunkier in Papers2, and the support staff has already acknowledged as much. There are several other issues, that make Papers2 feel very beta. Given that it’s brand-new, that’s not exactly surprising. But Papers1 was so refined, that Papers2 seems very clunky in comparison. But I think Papers2 does have a lot of potential. For those worried about trying Papers2, have no fear: the new version doesn’t overwrite your Papers1 data and PDFs, so you can use both versions side-by-side until you’ve made up your mind. During the 30-day free trial, for instance. For the Mac, Papers1 has been the cleanest, coolest, and bestest PDF organizer. Hopefully Papers2 cleans up nicely and becomes my new favorite. But right now, Papers2 is not clean enough for me to recommend anyone using Papers1 switch over to the new version. UPDATE: In the last two weeks, Mekentosj has provided two updates to Papers2 that have made it significantly better. Papers2.0.2 has fixed a lot of the bugs and annoyances in the version I reviewed above. For instance matching is much much better. 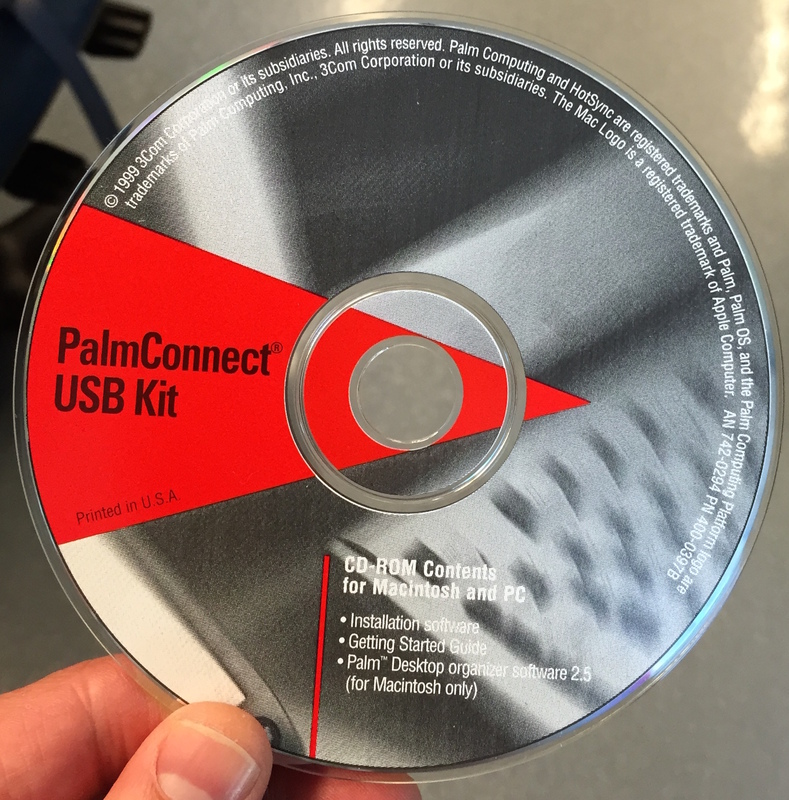 Like I expected, the folks behind the program are working really hard to make it the best program, evar! UPDATE2: I use Papers2 daily and I love it. It still has some things on the wishlist that I look forward to, but I think it’s a great program. I guess it just had some bumps at the beginning. UPDATE3: Papers2.1 is now out at better than ever. Definitely better than Papers1. I can recommend without hesitation that you get this software! UPDATE4: A bookmarklet for JSTOR. how do you read PDFs? Of course, cost is a factor, but I don’t want to go for the cheapest option if I end up never using it! My guess is that the Kindle DX is the best for reading PDFs, but loses on other fronts (e.g. large, expensive, limited, only grayscale). The iPad is a versatile color reader and I can sync with programs such as Papers or Mendeley (soon for the latter), but it is very expensive. Also, the screen isn’t as nice for reading print. The iPhone is way too small to read PDFs. Man, I need to test-drive these devices for a month! 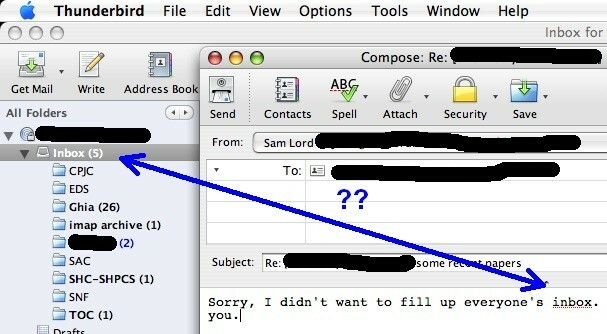 why are email clients dumb? Why does Thunderbird not recognize the word “inbox”? It seems to me that it should. This is pretty cool. Check out this chemistry dictionary for Word that contains thousands of chemistry words for the spell checker. That should reduce the little red squiggles all over the documents! Thanks azmanam over at Chemistry-Blog. I’m using it. 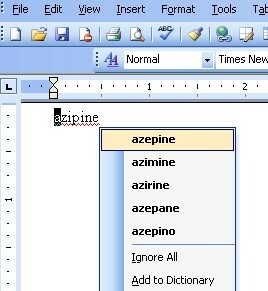 It knows what an azepine is! 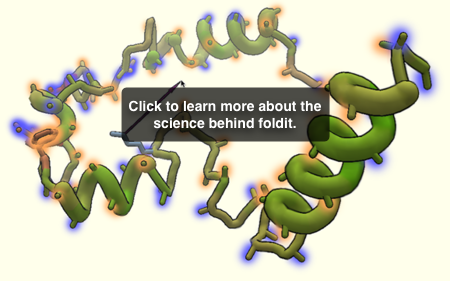 Gaming for Science: Fold.it goes public! Details about the science are sparse, but my undestanding is that they’re trying to train us like a neural network of sorts- first we learn to fold known protein structures, and then the group will release new “puzzles” of unknown or unreleased structures and see how the the borg collective does against other folding projects . This gum must have brain-boosting powe, with all its “proven” ingredients (including rosemary and peppermint). It does have 20 mg of caffeine (which is a little less than a cup of green tea of a Coke), which I’ve found does help concentration; but coffee makes my breath smell so much better! This caffeine is “natural,” which is nice because I’m sick of getting my caffeine the only other way possible: via that intravenous injections of SynthCaffTM eight times a day. Well, I guess this product is no worse than all the other “mind-boosting” drinks and pills out there; and it tastes good! I did feel a little different after chewing it for 15 minutes, but no different than after half a cup of coffee, wondrous coffee. Jeez, I almost recommend it. (That’s embarrassing.) 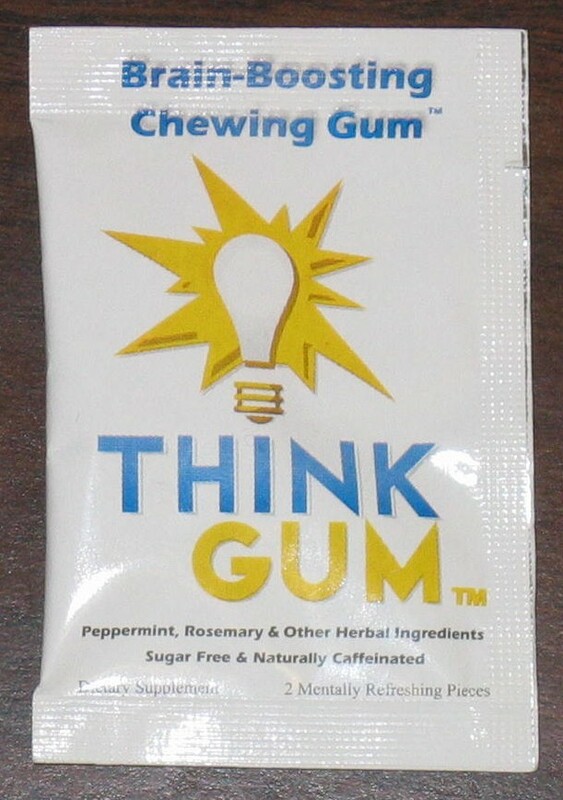 But I recommend it if you want a nice flavored gum with some caffeine that will make you light-headed and feel happy … and your French press is broken. 1 Great stocks to own, terrible companies to make you gum.